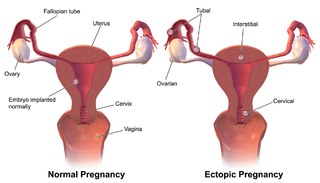 Ectopic pregnancies are pregnancies that develop outside of the uterus. Most commonly, a fertilized egg will nestle into one of the fallopian tubes rather than traveling down to the womb. But an ectopic pregnancy can also occur in other areas of the reproductive system, and even on top of the bowels. Most ectopic pregnancies cannot be carried to term, and require urgent medical intervention to save the mother's life. What are your chances of getting pregnant after an ectopic pregnancy? Ectopic pregnancies can end in a variety of ways, they can occur in various parts of the abdomen, and can also be caused by a range of factors. Your chances of getting pregnant after an ectopic pregnancy depend on all of these things, so let's walk though them. Some ectopic pregnancies end naturally in a miscarriage. Others end with the evacuation of the embryo, while leaving the reproductive system completely intact. When a fallopian tube has began to rupture, or is threatening to do so, removal of the tube is extremely common and life-saving. In some rare cases, ectopic pregnancies are discovered late and can even result in a live baby one British woman had her baby son, Billy, who grew outside the uterus nestled into a wall of her bowels. One possible cause of ectopic pregnancy is blocked fallopian tubes. This can be caused by Pelvic Inflammatory Disease and other reproductive conditions, or it can be caused by permanent birth control procedures gone wrong, like a tubal ligation side effect or Adiana permanent contraception that is supposed to block the fallopian tubes. Women whose ectopic pregnancies ended naturally or whose reproductive functions are intact should have the same chance of getting pregnant and having a normal, healthy gestation as they did before the ectopic pregnancy. Those who had a fallopian tube removed might have more difficulty getting pregnant, but it is mostly still very realistic to expect to get pregnant with one fallopian tube, naturally. On the other hand, women who have blocked or damaged fallopian tubes don't just risk another ectopic pregnancy, but they also may find it very hard to conceive. What is Adiana permanent contraception? Percentage of pregnancies taken to term with no Fallopian tubes?